Tall spikes of deep-pink or purple tubular flowers, maroon-spotted inside, in June and July. 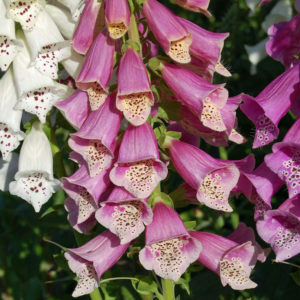 Foxgloves are native wildflowers and are a magnet for bees and other beneficial pollinating insects, they’re perfect for a wildlife or woodland garden. 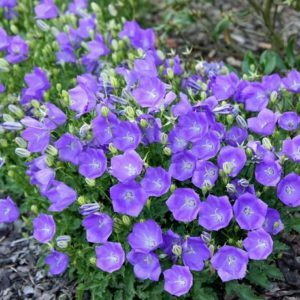 Stately spires of semi-double, deep purple flowers, opening in June and July on tall stems. 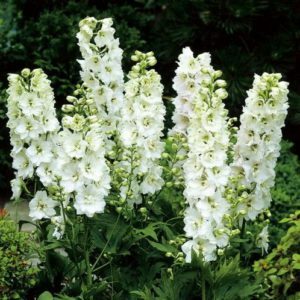 These dark-eyed delphiniums look fantastic planted in bold clumps as part of a cottage-garden scheme or towards the back of a well-drained, sunny border, where they will add height and bold splashes of colour and can be as high as 5ft tall but may need supporting if they get this high. They also make excellent cut flowers.